Located on the South Carolina border in the Sandhills region of North Carolina, perhaps what is most notable about Scotland County is its level of impoverishment. Scotland has one of the highest unemployment rates in the entire state – 16.1% as of April 2013. The textile jobs once filled by Scotland residents are now gone, with nothing to take their place. Equally discouraging is the county’s property tax, the highest in North Carolina. Scotland’s county seat is Laurinburg. The county is named after the country of Scotland due to the large majority of settlers who were of Scottish descent. There is also a high population of Lumbee Indians in the county. The county is relatively young. Founded in 1899, Scotland was originally part of Richmond County. The recently elected Democratic legislature flexed their political muscles by separating the Scotland area from then-Republican Richmond in order to create a Democratic county. In that time, the town of Laurinburg was notorious for intimidating Republican voters and throwing out their ballots. Politically, Scotland is still one of the most reliably Democratic in the state. In 2010, the white population dipped down below 50%, making Republican victory here all but impossible. The last Republican to win the county was Ronald Reagan during his 1984 presidential landslide over Walter Mondale; he carried it by 49 votes. Forecast: Scotland is a county in decline. It barely achieved a positive growth rate during the 2000s. The white population is especially in decline – a 9.24% drop from 2000 to 2010. This is bad news for Republican chances in the county, but Scotland’s small population renders it pretty much inconsequential to state politics, as has been the case for most of its existence. As of 2010, there were 36,157 people living in the county. In recent years there has been a collapse in the white vote for Democrats. A candidate like Hillary Clinton would probably perform stronger with these voters, not that it would matter. With a majority minority population, Scotland is guaranteed to go for any Democrat. The Obama registration effort in 2008 and 2012 also went a long way toward increasing participation among Scotland’s African American population. In Congress, the county is represented by Richard Hudson, a Republican. Gene McLaurin, a Democrat, represents it in the State Senate. McLaurin’s seat could prove competitive. 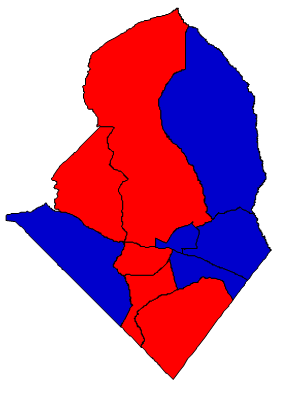 In the State House, Scotland is divided between the 48th and 66th districts, represented by Democrats Garland Pierce and Ken Goodman, respectively. The 48th is a VRA seat designed to elect an African American candidate, the 66th takes in precincts that are whiter and ancestrally Democrat. Garland Pierce is a Baptist minister from Wagram, a small town in Scotland County.